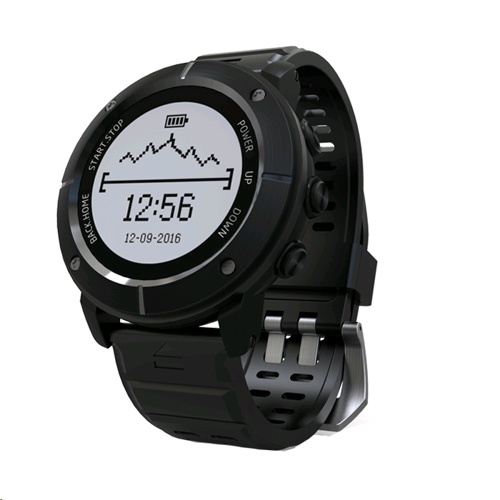 Powerful, Waterproof and Multi-Sports smart watch tailored for hikers and runner featuring integrated navigation system, powerful battery life, real-time body condition monitor, location and trail sharing, and various sports modes that makes your outdoor activities safe and fun. Built-in GPS + GLONASS + Beidou mark your starting point and track the distance, speed and pace when you are hiking, even when your smart phone is not around. It will guide you back to where you set off, so you will never need to worry about getting lost. 10 different sports modes: Running / Walking / Marathon / Swimming / Surfing / Rock Climbing / Mountain climbing / Cycling / Boating / Skiing and Golf. It will measure useful data based on your chosen sports modes and sync to your smartphone APP. With compass, Weather (need app connect), Barometer, Altimeter, Thermometer and Hygrometer, With Heart Rate Monitoring, SOS, Calls and SMS/SNS text Notifications, APP with Club function, share your favorite trails to social media or sent SOS message to your friend when in dangerous, Compatible with Android and iOS smartphones.